There have been 1,840 capital city auction results reported to CoreLogic so far this week, resulting in a preliminary auction clearance rate of 69.1 per cent across the combined capital cities. There were a total of 2,323 capital city auctions held this week, down from the 2,444 held last week. 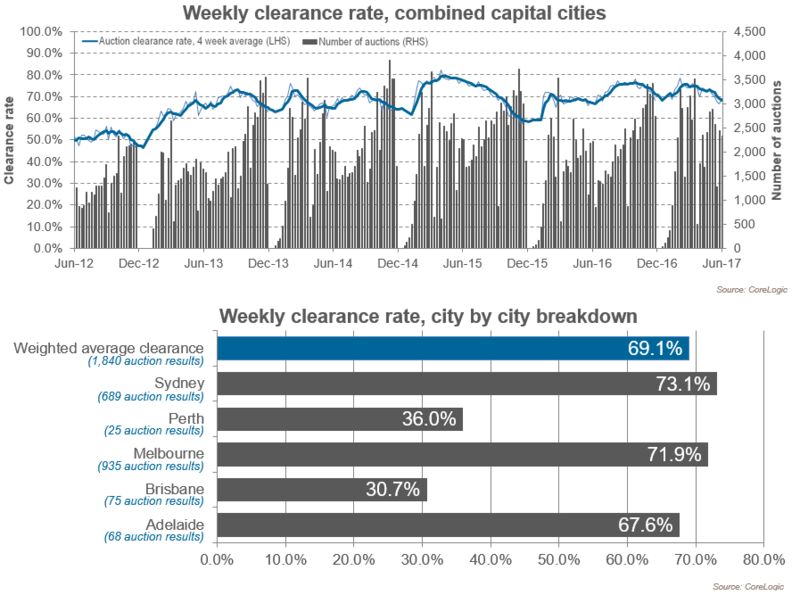 This week’s preliminary result indicates that clearance rates are continuing to soften, after last week saw the final clearance rate surpass the previous week as the lowest recorded over the year to date across the combined capitals (66.7 per cent). With results still being collected, it is likely that the final clearance rate this week will revise even lower again. However, compared to results from one year ago clearance rates are relatively similar with the 66.4 per cent rate of clearance across a slightly lower volume of auctions (2,218). Melbourne’s preliminary clearance rate increased to 71.9 percent this week, up from last week’s final of 71.0 per cent, when the lowest clearance rate since July last year was recorded. Auction volumes decrease slightly with 1,050 auctions held over the week, down from 1,129 over the previous week. At the same time last year, the clearance rate was 67.3 per cent across 1,029 auctions. Looking at Melbourne’s sub-regions, the Mornington Peninsula region was the best performer in terms of clearance rates, with an 87.2 per cent success rate across 44 auctions, followed by the North West region, where 79.5 per cent of the 90 auctions sold. Across Sydney, 918 homes were taken to auction this week with the preliminary clearance rate for the city above 70.0 per cent (73.1 per cent). After last week saw the final clearance rate drop even lower for the 3rd week in a row, with 66.7 per cent of the 927 auctions clearing. One year ago, 816 Sydney homes were taken to auction and the clearance rate was 73.5 per cent. Sydney’s North Sydney and Hornsby region hosted the most auctions of any Sydney sub-region this week, with 150 properties taken to auction. The preliminary clearance rate for the region is 84.3 per cent across 108 results. The preliminary clearance rate in Brisbane this week was 30.7 per cent, down from 46.4 per cent over the previous week. Auction volumes were lower this week with 129 auctions held, down from 151 last week. Meanwhile, across the Gold Coast, 31.8 per cent of the 22 reported auctions were successful. A total of 101 Adelaide homes were taken to auction this week, with a preliminary clearance rate of 67.6 per cent across 68 results, down from 69.5 per cent last week when 103 auctions were held across the city. In Perth, 54 auctions took place this week, with 25 results reported so far. Perth’s preliminary clearance rate of 36.0 per cent across these 25 results is higher than both last week’s result (32.3 per cent) and the clearance rate from one year ago (21.2 per cent). Canberra’s preliminary auction clearance rate of 73.9 per cent this week is higher than last week, when the final auction clearance rate was 50.8 per cent and higher than the 71.2 per cent recorded last year.